PV solar project in California, a 6.7 MW project for Southern California Edison in the town of Porterville. To build a utility scale solar power park, and finish it on time, takes a well-orchestrated plan with all parties reading from the same score sheet. But erecting a 6.7 megawatt facility in one-third to one-half of the typical timeframe—as Cupertino Electric did in Porterville, California, for Southern California Edison (SCE)—takes an overdrive speed that musicians refer to as prestissimo. It also takes pre-planning, thinking ahead, and using vendors you know can meet your time schedules, says Meisa Kassis, project manager for San Jose-based Cupertino Electric Inc., electrical contractor on the project. "We were awarded the bid on Thursday and had to mobilize the following Monday, so we didn't have very much time," Kassis says. "In the interim, we were thinking about it, but really, we had very little time. Luckily, Cupertino Electric has a lot of internal resources that make it possible to do a project like this one." When it was dedicated this past February, the multi-million-dollar Porterville project was the largest utility-owned PV project in California. The ground-mount Porterville project is located in the southern end of California's Central Valley, a predominately agricultural region. The town of about 55,000 was chosen for a large-scale solar-generation site because of suitable land, distribution circuits that can support a large amount of solar power without the need for major costly upgrades, and anticipated future power needs, says Gil Alexander, a spokesman for SCE. Porterville city leaders were willing to work with the utility to draft a suitable lease for the land adjacent to the airport on which the PV system was built. 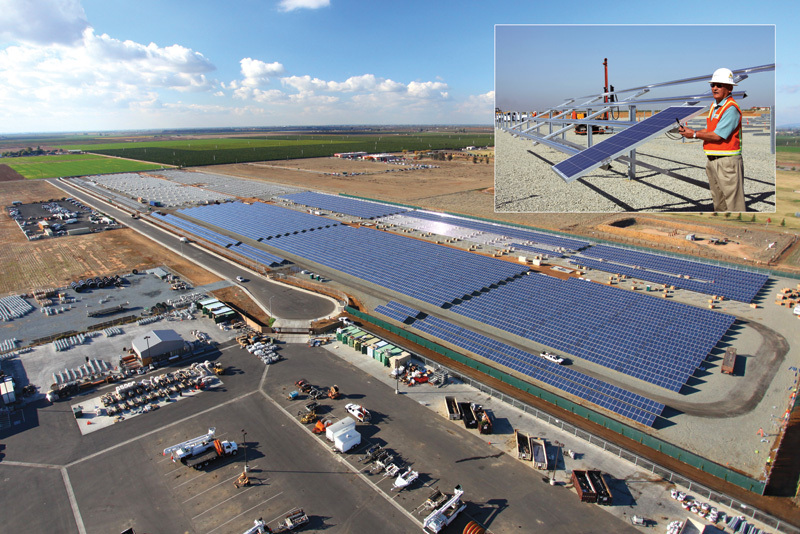 Of the 11 large-scale PV projects SCE had in the works at the time, the Porterville project was the only ground-mount; the remainder were all roof-mounts. All of the projects are part of a larger effort by the utility to build and own 250 MW of solar generation within the next five years. In addition, SCE will execute power purchase agreements with independent power producers that represent another 250 MW. Begun in 2008, SCE's initiative will eventually create a network of mostly 1 to 2 MW rooftop and ground-mount solar power plants throughout the utility's Southern California service region. The California Public Utilities Commission approved the program in June 2009. Unlike many earlier solar plants that fed electricity into a main substation for transmission, most of SCE's projects will connect directly to the nearest neighborhood power circuit, eliminating the need to build new transmission lines or upgrade existing substations, Alexander says. Under the California Renewable Portfolio Standard, utilities were required to derive 20 percent of their power from renewable sources by 2010. A new law passed by the California Legislature raises that to 33 percent by 2020. And the network of solar generation plants, including the Porterville project, will go a long way to helping SCE meet those goals, he says. SCE began talking to Porterville city leaders in 2009 about a 20-year lease for 32 acres adjacent to the city's airport. The parcel was zoned industrial so the land didn't have to be reclassified. 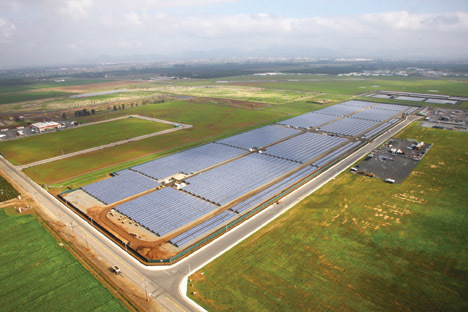 Building a 6.7 megawatt solar power facility in one-third to one-half of the typical timeframe—as Cupertino Electric did in Porterville, California, for Southern California Edison—took pre-planning, thinking ahead, and using vendors Cupertino Electric knew could meet their time schedules. The utility issued a request for proposals during summer 2010 and awarded the bid in late-September, with project completion in three months. The short building phase was possible because of careful pre-construction planning, which took more than a year, as well as lessons learned about installation efficiencies at Edison's previous solar facilities, Alexander says. He adds, "SCE always attempts to minimize on-site construction timeframes to minimize the impact on the neighbors." From the time it submitted a bid until the time it was awarded, Kassis says Cupertino was pre-planning the project. When it was awarded the contract for electrical services, Cupertino had to hire a total of 125 electricians through the International Brotherhood of Electrical Workers Local 47. Typically, they would need about 50 workers for a project of this size. "So a lot of our labor force were unknown folks from Local 47," she says. Cupertino always had one of their foremen on site to supervise the crews, and Kassis credits the union electricians for their professionalism in overcoming the project challenges. The Porterville project was constructed concurrent with Cupertino's work on two other SCE roof-mounted projects totaling 7 MW. "Adding to the complexity, we had three going on at the same time with very similar needs," Kassis says. "But Edison is good about providing information in a timely manner" to keep the projects moving forward. In its favor, the San Jose firm had just completed a 1 MW design-and-build PV project in Northern California. "We had learned engineering best practices that made a project more constructable, so this helped us fast track this project," she says. With the Porterville project, for example, Cupertino brought in a larger trencher that could cover ground faster than a typical trencher. Despite the tight time frame, Kassis says safety was always at the forefront. "Safety is a big deal for us," she says. The Porterville project involved 29,428 Trina TSM-PA05 230W modules, which had to be shipped in containers from China. They arrived at the Port of Los Angeles and were trucked approximately 320 miles to Porterville. "We would have four, five, or six containers coming out of the Port of Los Angeles, most just-in-time deliveries," Kassis says. "We like just-in-time so you don't have a lot of material sitting on the site, just for security reasons alone." What was out of Cupertino's hands was the actual product availability and delivery schedule. "When you have 7 to 20 MW coming from overseas, sometimes you're kind of constrained by those delivery dates and the manufacturing capacity for those solar modules," Kassis says. Construction began in October 2010 and coincided with one of the rainiest winters in California history. "The record-breaking 100-year storms and rain levels presented even more of a challenge," she says. "We worked in the rain when we typically wouldn't have worked in the rain, just to keep on schedule. You lose productivity in the rain—it's definitely not ideal conditions." When it wasn't raining, Cupertino had to pay attention to dust being generated by the delivery trucks. The San Joaquin Valley Regional Air Quality Board requires dust mitigation, either using water trucks to spray water on dirt roads or using a polymer dust-reduction agent. Southern California Edison began talking to Porterville city leaders in 2009 about a 20-year lease for 32 acres adjacent to the city's airport for the solar power project. The parcel was already zoned industrial so the land didn't have to be reclassified. "Because of the nearby orchards and cotton fields, we were very sensitive to the farmers," Kassis says of the dust concerns. In addition to a dust-control plan, Cupertino also implemented a storm water pollution prevention plan to address any runoff from the project site. Schletter Inc. of Tucson, Arizona, supplied the racking for the system, which involves a 25-degree fix tilt. Satcon Technology Corp. supplied the inverters. Unlike many utility-scale PV systems that feed into a substation, the Porterville project feeds directly into neighborhood lines—a task easier said than done. Supplying electricity locally eliminates the need to upgrade lines or substations, SCE's Alexander says. But neighborhood lines aren't designed to carry millions of watts of intermittent electricity from solar-generation facilities. Solar power generation fluctuates and peaks during mid-day. It can wane due to cloud cover or dense fog or stop completely during the night. To handle these electrical spikes that could wreak havoc with residential and commercial electrical appliances alike, SCE is working with the industry to develop smart-grid technology. New circuit designs would instantly adjust and compensate to varying power levels without even the most sensitive appliance registering it. When it embarked on a goal of developing 250 MW of utility-owned PV generation, SCE officials predicted the company could lower the cost of construction from the industry prevailing $7 per watt to about $3.50 per watt. As the projects continue, Alexander says SCE is edging closer to realizing those savings because of economies of scale. "One way of understanding economies of scale is the experience many of us have on a weekly basis—buying household supplies from a ‘big box' store," he says. "We've learned that we can pay much less for paper towels if we are willing to buy them in much larger quantities than we would at our neighborhood grocery store. "Other cost reductions were also achieved via various engineering improvements made and equipment standardization across our various solar sites."